We are totally obsessed with the cutest selection around, the Dovecraft Back to Basics Baby Steps collection. Today, Maxine is going to show you how to make this crafty bundle of joy for a loved one! How adorable is this scrapbook layout? We love the way it unfolds to reveal the surprise hidden inside. To help you focus on getting creative, we have designed a template for you to use to make this layout super easy to create. 1. Download, print and cut out the free scrapbook layout template. 2. Cut and score as shown on the template on your chosen sheet from the Dovecraft Back to Basics Baby Steps 12x12 Paper Pack. Score the two diagonal lines as shown, fold back on itself so that the pattern is showing on the paper and adhere the side to create a pocket. 3. Cut a piece of First Edition Textured Card stock down to 18cm x 8.5cm. With your card horizontal, score at 8.5cm and 9.5cm, to make a cover. 4. Cut an 8cm square of complementing paper to fit on the outside of the cover. Stick a complementing piece of paper to the back of a Baby Steps Wooden Frame and cut off the extra paper from the edge. Adhere to the front of the cover, horizontally. Add a die cut from the First Edition Baby Themed dies set, Baby Steps gems and a ribbon bow to decorate the front. 5. Cut two pieces of ribbon, 20 cms in length, adhere a piece to each side of the cover on the inside. Cover each ribbon with two 8cm x 8cm squares of Baby Steps paper and adhere these with Dovecraft Perma Fix tape on the left and right hand side of your cover, ensuring to leave the middle uncovered. Adhere the centre square of the layout to the inside of the cover, on the right hand side. 6. Adhere one of the Baby Steps circle tags to the inside of the scrapbook template. Cut another Baby Steps tag to fit in one of the pockets you created. Add photos and journaling to the inside. What a wonderful keepsake this would make for a loved one! 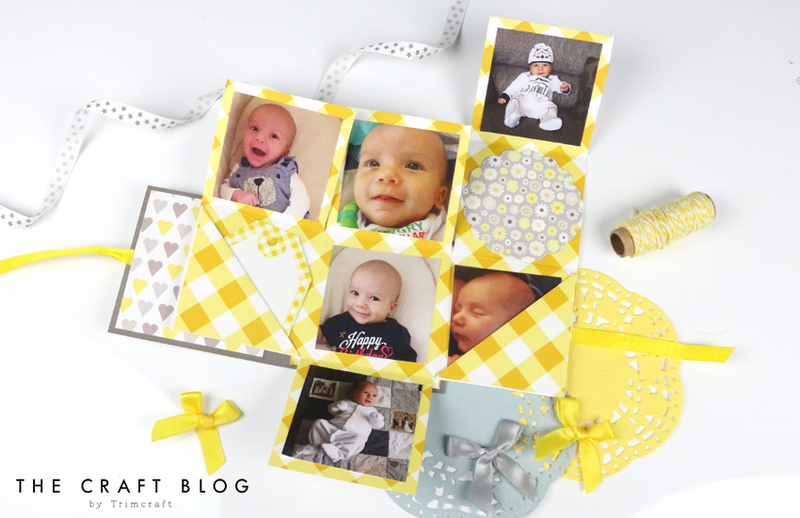 The Baby Steps collection really makes this little scrapbook come to life. How will you use our free scrapbook template? We would love to see so don’t forget to share your makes in the Inspiration area and to #trimcraft when uploading to social media! I love projects like this but I may be a little slow here but is it possible to have a few more instructions on the size of squares as my printer printed a template too small. Also, I am not sure how to fold in the individual squares. Can anyone help? WOUW this is so cute and just perfect timing, as my daughters best friend just got a little babygirl here the other day, so will definitely give this one a try here now right away. It´s sooo cute and sweet. Thanks sooo much for the template. Hi, where do I get the template to download it?